In this second issue of The Amazing Spider-Man, we have the inspired addition of yet another piece of the Spider-Man mythos. Last time out, we met J. Jonah Jameson, publisher of The Daily Bugle and NOW Magazine, with an instant dislike and furious vendetta against the vigilantism of our hero. However, he's so far been unable to run any pictures alongside his mad crusade, as no one's been able to photograph the wall-crawler to date. 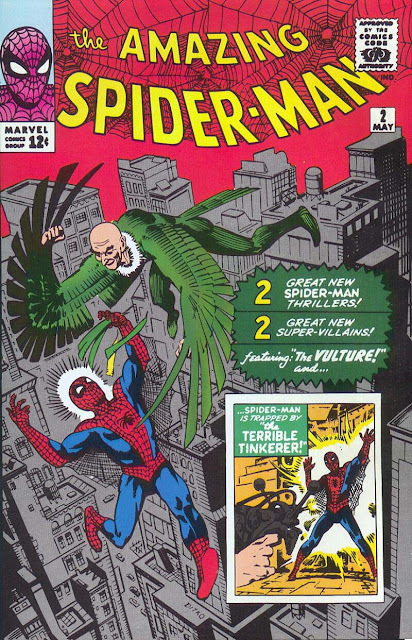 In this, Peter sees a remarkable opportunity - and one filled with delicious irony - and soon figures out a way to take snapshots of himself as Spider-Man in action, fighting the new menace of the Vulture. 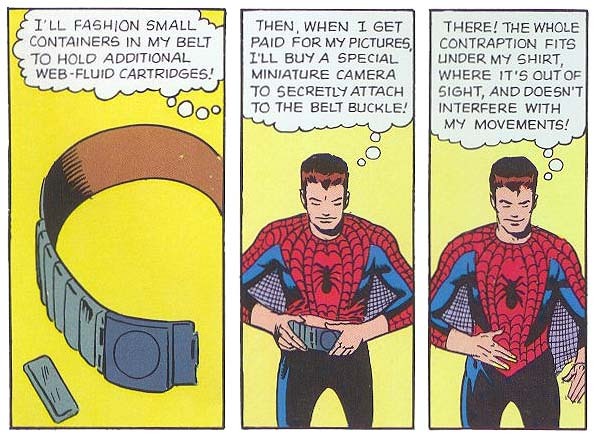 Jameson is so overjoyed at the appearance of the photos that he readily buys them under a condition of "no questions asked", and this arrangement would be a defining part of the Spider-Man stories for decades to come. Spider-Man's newest foes: a couple of geezers. Maybe he can just wait them out? 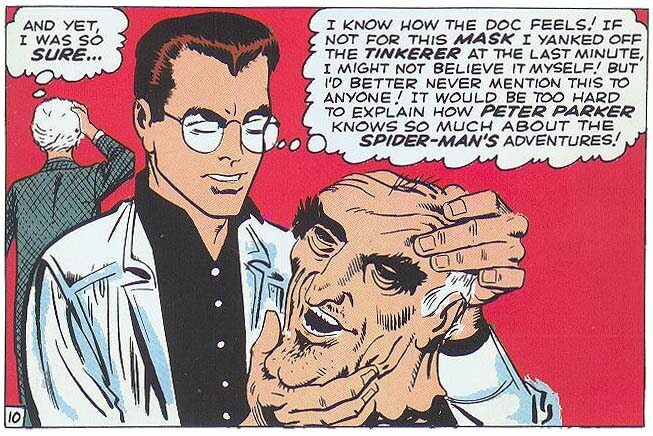 It's been said before, but it bears repeating: One of the biggest innovations that Stan Lee brought to his stories was making his characters feel like real people, with genuine feelings and reactions to which the reader could relate. For instance, a common objection to the character of Superman is the meekness that makes up his alter ego of Clark Kent; the reader can understand a desire for anonymity, but it's his smiling, unbothered response to countless insults and looks of disdain that stretches the credibility. By contrast, when teenage science nerd Peter Parker is openly mocked by his classmates, he doesn't chuckle and flush with embarrassment. Instead, he becomes surly, tossing back fiery invectives of his own - and it's this seething anger that we recognize. The patience of a Superman might be what we aspire to, but the hotheadedness of the Marvel heroes is who we often tend to be. The second story in this issue features the menace of the Tinkerer, initially posing as a radio repairman ... but soon shown to be spearheading an alien invasion! Having seen this plot device for the umpteenth time - not to mention its countless occasions in Marvel's monster mags of the era - we can't help but wonder why there was such an obsession with xenophobic stories, desperately paranoid of attack from without. We could point to the wars of its recent decades, from World Wars I and II, to the Korean War, and the then-current Vietnam war. However, although each of those made use of conscripted soldiers, and could thus be seen as agonizing examples of outside forces tearing families apart, the point remains that in none of those cases was the United States ever in serious danger of actual invasion, regardless of what the McCarthyist paranoia of the 1950s might have you believe. Instead, perhaps this was a surprising effect of the first real signs of modern globalization, as radio and television were now able to bring to the masses word of faroff lands with shocking immediacy. To a people of still-huddled masses, who had founded the Pony Express as the apex of rapid communication just a century before, the dizzying speed of technological progress - and how it made the world seem so much smaller than it had been before - might have been worrying indeed. Annnnnnnd it's aliens. Of course. And they've got another foolproof plan! The two stories in this issue also gives us a chance to briefly examine the way that comic book stories evolved in terms of page count and reader expectations. In the 1930s and 40s, most comic books were enormous affairs that contained, on average, 8 (or so) different yarns of 8 (or so) pages apiece, each of them generally a complete story in and of themselves. Compare that to today, where the average 32-page comic has 22 pages of story content - but a single tale usually takes six consecutive issues to tell the story, from beginning to end (and often not even then). Clearly Marvel in the 1960s were in something of a transitional phase, as most of their output were still anthology titles like Tales to Astonish, Gunsmoke Western, Love Romances and Strange Tales, all of which offered an assortment of smaller stories each month. And even when Stan started putting superhero features in the front of some of these anthologies, like the Human Torch tales that would take up the entire first half of each issue, that still meant (for instance) there would be two 5-page comics and a 2-page text story to follow. So, while a single comic split into two separate stories - as done here, and in several of the early Hulks - might seem unusual to our modern eyes, it was very much a product of the time. It wouldn't last much longer, however, as just a few years later almost every comic Marvel put out would have a single, complete story between its covers - a paradigm that would last for the better part of the next two decades. What?! That was a mask?! But that's impossible!